When Barbie doll (sold separately) hits the road in this camper, anything is possible — because this RV offers more than meets the eye! When road-ready, it’s a glam vehicle with signature style and two seats upfront (with seatbelts, of course!) — but lift the handle and it pops up to transform the camper into a three-story play set with all kinds of possibilities for an amazing outdoor camping adventure! Plus, the transformation doesn’t stop there with even more play spaces for even more storytelling possibilities. Convert the front cab into a bathroom — remove the chairs to reveal a toilet underneath and flip the steering wheel to turn it into a sink. Transform the back of the cab by flipping over the spare tire cover to reveal a fire pit and opening the back door to reveal a kitchen complete with fridge, sink, oven and stove that lets kids’ imaginations really get cooking! The center room has a double bed with hammock hanging above, perfect for a quick nap after a fun camping adventure. Slide the pool out from the bottom of the camper and connect it to the slide that starts on the second floor. 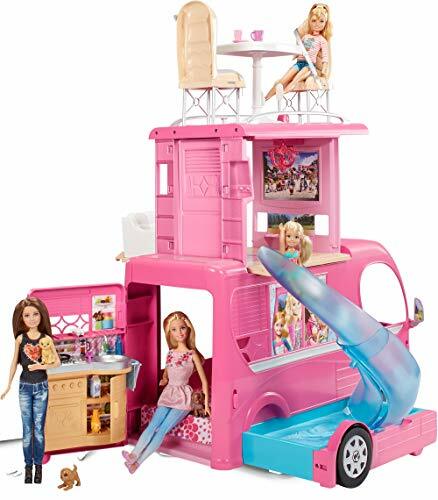 Barbie doll can slide down from the second-story living room (featuring a couch, TV and glam chandelier) to make a splash at a fun campsite pool party. On the third floor, set up the dining table and chairs for meals under the stars or a fancy picnic under the sun. 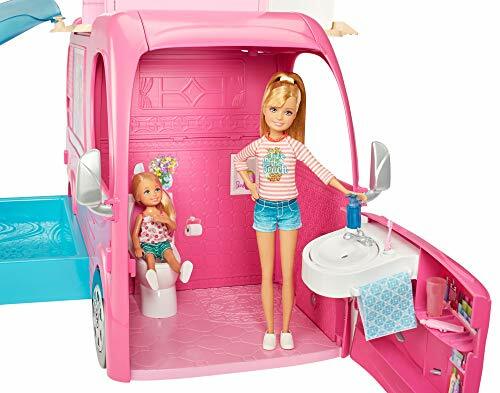 Recreate scenes from the movie that the camper appears in, Barbie & Her Sisters in the Great Puppy Adventure, or hop into the driver’s seat to tell stories of your own. Included accessories — a fire pit, roasting sticks with marshmallows, cookware, food and place settings — add to the camping storytelling fun. 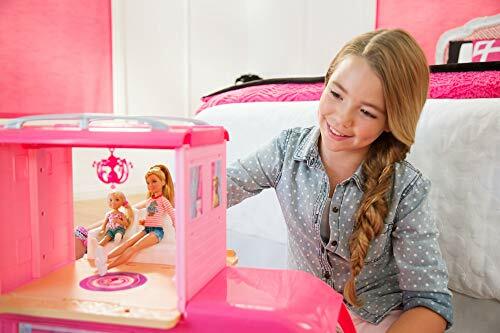 With signature touches like a chandelier, pretend TV with remote and space for all four sisters to sleep (including the fun fabric hammock), Barbie can really get glamping. Camper includes transforming features, swimming pool with slide, sofa, bed, blanket, table, two chairs (with removable seat belts), tire cover/fire pit-campfire, roasting sticks with marshmallows, popcorn in bowl, juice bottle, egg carton, milk carton, frying pan, spatula, soap bottle, toothpaste, toothbrush, towel, plates, cups and two bed pillows. Dolls sold separately, subject to availability. Dolls cannot stand alone. Colors and decorations may vary.